The Boss. In charge of the lifeboat and crew. Keeps everyone on their toes. Experienced in other roles on the boat. Shoulders the responsibility for keeping the crew safe. A mechanic also goes to sea with the All-weather boat. At sea they keep the boat going, and monitor the mechanical running of the boat. On shore, they undertake routine maintenance of the boats to ensure they are in tip-top condition. 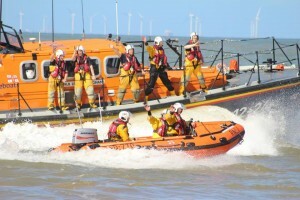 The senior member of crew on the Inshore Lifeboat (ILB). Runs the navigation equipment on the All-weather boat. Records the position of the lifeboat on charts, plots search patterns and routes to casualty vessels. Not an easy job on a rough day! Responsible for launching the lifeboat safely, often into a rough sea and in the dark! Well trained in dealing with the challenges of ﬂooded beach gulleys, and accurate positioning of the lifeboat carriage when recovering the lifeboat. There are jobs a plenty for all of the crew besides the speciﬁc roles mentioned on these pages. We work as one crew, and help each other to achieve the best end result: anchoring, setting-up for a tow, fendering, ﬁrst-aid, lookout, operating the salvage pump, casualty care, radio-work, rope work, polishing, controlling emergency steering equipment, steering, shore-crew, refuelling, washing-down, fundraising, lifeboat tours, making the tea, clearing sand, ﬂoodlight operator and so much more!